The Russian Invitation Letter is a requirement for you to obtain the Russian Business Visa. The document is in A4 format and indicates that you are invited to Russia by an accredited Russian travel company or a hotel. iVisa provides Russian tourist and business invitation letters depending on the purpose of your trip and whether you are applying for a Russian Tourist or Business (Commercial) Visa. Applying for the Russian Business Invitation Letter is easy and fast with iVisa. The process is 100% online. Travelers simply provide personal and travel information and the Russian Business Invitation Letter can be generated in 1 business day (with super rush processing). You can print the Business Invitation Letter and use it as one of the documents required for your Russian visa. You are applying for a Russian Business Invitation Letter and not a Russian Business (Commercial) Visa. The Russian Invitation Letter is a requirement for you to obtain the Russian Business Visa. Please note that the Business Invitation Letter is a scan of the original. This is typically acceptable at most Russian Embassies, but there are cases where the Embassy may require the original. We suggest all applicants inquire to see if the original is required at their specific consulate, as we are unable to send originals at this time. After you receive your Invitation Letter via email, you can apply for the Russian Business Visa at one of their embassies. You don't need to book a hotel or flight prior to your application for the Russian Visa Business Invitation Letter. You will, however, need to provide basic company information, as this is regarding a Business Visa. 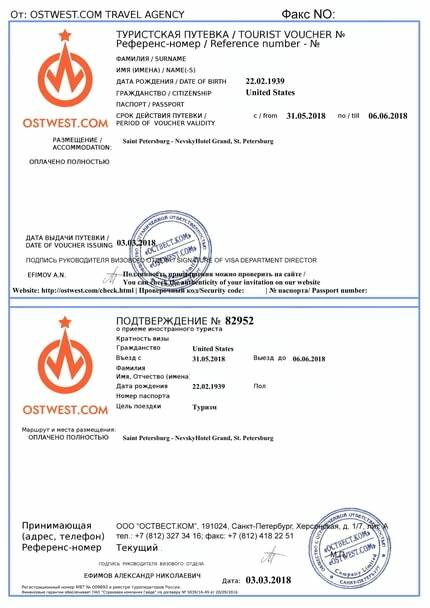 The Russian Business Invitation you will receive from iVisa consists of a Business Confirmation Letter (“подтверждение о приеме иностранного туриста” - in Russian). Business Invitation Letters are only available to EU citizens, US citizens and a few others. The Russian Business Invitation Letter will be in Russian. What is the Russian Business Visa Invitation Letter? It is a document that indicates that you are invited to Russia by a Russian travel company or a hotel that is accredited by the Ministry for Foreign Affairs of the Russian Federation. This document consists of two parts: A Voucher and a Confirmation of the Admission of a Foreign Tourist. In order for you to apply for a Russian Business Visa, you will need to present an Invitation Letter as a part of your application. Is there anything specific I need to know regarding the Business Invitation Letter? Typical Details in the letter include: name of travel organization, its address and TIN number etc. Print your invitation in color. Submit the letter as well as all the other required documents required for your visa application at the embassy. These typically include: a color visa/passport-sized photo, health insurance, proof of finance, returns flights etc. (iVisa suggest that you consult directly with the embassy nearest to you for a full list of required documents). After your visa interview at the Russian embassy, they will issue you your visa, if approved. No, you cannot. The Business Invitation Letter allows you to apply for the actual Russian Business visa. The Tourist Invitation Letter allows you to apply for a tourist visa, while the Business Invitation Letter allows you to apply for the business visa. The tourist visa limits the traveler to tourism activities. If your reason for travel is to conduct business, you must obtain a business visa. What is the difference between a Business Invitation letter and a Russian Visa? The Business Invitation Letter is a document that must be submitted along with your visa application. It is not an actual visa, but rather a document that the Russian government requires when applying for an actual visa. If you are interested in expanding your business in Russia or you plan a collaboration with Russian companies, it is probably best that you learn how to interact with Russian business people. It is not challenging to learn, and since Russia is a traditional country, not doing so may end up in failure. A saying as old as time says that ‘when in Rome, do as Romans do,’ and that principle applies to any other country you may want to do business with. Nevertheless, if you read a thing or two on how to behave and learn about the business mentality in Russia, you should do just fine and have a successful business trip. When it comes to the business mentality in Russia, the main thing that you need to know is that there is more than one way to do business. You will come across modern enterprises, while others are run in a Soviet manner, so to speak. The latter entails a lot of bureaucracy. However, if you have to, you need to prove that you are patient, and you should never lose it since it is a sign of weakness for Russians. Things are what they are, and your only chance is to accept that. One of the things that you need to know about Russia is that when it comes to business, the circles are closed. You need some sort of connection to enter that circle. Doing that without someone ‘on the inside’ is almost impossible. The good news is that you can make connections pretty easily. For one thing, people there like gifts. You do not have to spend a lot of money on them. A simple item, especially something from your own country with a logo on it, should be sufficient. Moreover, there is saying in Russia that goes something like this: hurry to listen, not to reply. That means you need to be patient during negotiations and do not expect an answer shortly. It may take a while. Lastly, you should never hard sell anything and confrontation should always be avoided. Leaving the business mentality aside, we should move on to greetings. There is nothing out of the ordinary when it comes to how you salute people. A firm handshake while maintaining eye contact is a sign of strength, so you should practice it if you are not very good at it. However, there is a rule about this. You should never have a handshake or take/give something over the threshold of a house or room. You need to first enter the house/room, and then extend your arm or give the gift. Plus, you should always have your hands naked before. Wearing gloves while shaking someone’s hand is incredibly rude. As for how you call people you meet, there is more than one way to do it. It is recommended that you learn some Russian names. If you want to say Mr., you use the word Gospodin before the person’s surname. With women, the name is Gospozha. You should never use a person’s first name unless they allow you to. Regarding communication, you are not asked to know Russian. You can hire an interpreter. However, your new business partners will appreciate it if you learn some simple Russians name and greetings. It shows that you are making an effort for them. Even so, Russians are taught English in schools, so chances are that the Russian delegation knows how to speak it. Just make sure that you are not talking too loud during a meeting or at lunch since Russians do not. If you are looking for good conversation topics, you should always avoid subjects like the monarchy, the Holocaust, Czarism, minorities, and other such sensitive issues. You can, however, talk about anything else, and you should not refrain from being honest. One way to a Russian’s heart is to show him or her pictures of your children if you have any. Russians are very fond of children, and they will appreciate the gesture. Another thing that you could do is learn something about Russia’s culture and history and talk about that. People in Russia are very excited when foreigners know about their culture. They are proud people, after all. The meetings and meals in Russia are pretty straightforward. It is mandatory that you hand your business card, but make sure that the other side of the card has a version in Russian. You are expected to be right on time, although you should not expect the Russian delegation to be just as punctual. If you go to dinner, you should not begin eating before the host does. It is considered a rude action. Plus, if you go to someone’s house, a gift is necessary. One of the things that you should keep in mind at dinners in Russia is that Russians like toasts. Even if you do not drink alcohol per usual, you should still raise your glass and take a few sips. Besides, drinking with your future Russian business partners is more important than you think. If you accept a drinking invitation, it shows that you are interested in building a strong relationship. It is also a sign of goodwill. Other small aspects include not showing the soles of your feet, you should never cross your legs or rest your ankle on your knee. You should always dress conservatively, and mind your hands. You should never keep them in your pockets. You should always maintain eye contact with someone while you speak to them. Lastly, it is insulting to call someone using your forefinger when you gesture. Instead, face the palm down and pull your fingers all at once. It is much better that way. As you can see for yourself, the business etiquette in Russia does not include complicated customs. If you want to be successful on your trip, we recommend that you learn things like this so that you manage to make a good impression. Surely Russian people would do the same if they came to you, don’t you think?